FILE PHOTO: Traders work on the floor of the New York Stock Exchange (NYSE) in New York, U.S., August 16, 2017. Wall Street looked set to open slightly lower on Wednesday as the U.S. corporate earnings season hit its peak, with a handful of companies including Chipotle Mexican Grill and AMD reporting lackluster results overnight. Chipotle plummeted nearly 12 percent in premarket trading after the burrito chain posted disappointing sales and earnings. Advanced Micro Devices tanked 10.46 percent after the chipmaker’s forecast pointed to its first revenue decline in seven quarters. Boeing slipped more than 1 percent after it booked a third-quarter charge related to its troubled KC-46 aerial refueling tanker. However, the earnings season has been largely positive, with more than 70 percent of the S&P 500 companies that have reported so far beating profit expectations. “The market is looking for additional fuel to continue the drive higher, whether it comes in the form of earnings or tax reform,” said Andre Bakhos, managing director at Janlyn Capital in Bernardsville, New Jersey. Investors were also keeping an eye on the nomination of the next Federal Reserve chief. Republican senators were favoring Stanford University economist John Taylor over current Fed Governor Jerome Powell, a source familiar with the matter told Reuters. At 8:35 a.m. ET (1265 GMT),Dow e-minis 1YMc1 were down 8 points, or 0.03 percent, with 26,008 contracts changing hands. S&P 500 e-minis ESc1 were down 3 points, or 0.12 percent, with 152,280 contracts traded. Nasdaq 100 e-minis NQc1 were down 9.75 points, or 0.16 percent, on volume of 24,699 contracts. Among other companies that reported, Walgreens Boots Alliance jumped 5 percent after the drugstore reported a 5.3 percent rise in revenue. AT&T fell 2.32 percent after the U.S. No. 2 wireless carrier’s quarterly results missed estimates as it lost video subscribers to traditional and online TV competitors. Northrop Grumman jumped 2 percent after the defense contractor raised full-year profit forecast and reported higher quarterly profit and revenue, boosted by strength in its aerospace business. Data showed orders for U.S. durable goods rose for a second straight month in September, beating analyst expectations and supporting the view of steady economic growth. Non-defense capital goods orders excluding aircraft, a closely watched proxy for business spending plans, rose 1.3 percent in September. Economists polled by Reuters had forecast an increase of 0.5 percent. 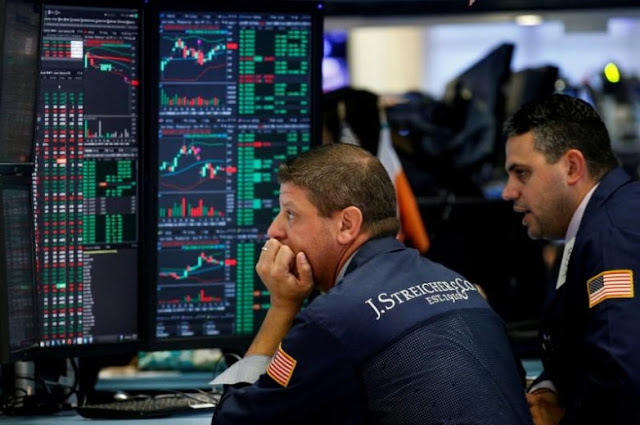 Wall Street looked set to open slightly lower on Wednesday as the U.S. corporate earnings season hit its peak, with a handful of companies including Chipotle Mexican Grill and AMD reporting lackluster results overnight. Chipotle plummeted nearly 12 percent in premarket trading after the burrito chain posted disappointing sales and earnings.